USA Networks has announced that White Collar and Covert Affairs will both be returning on Thursday, October 17th. Starring Matt Bomer and Tim DeKay, White Collar is back for season five at 9pm. The cable channel has ordered 16 episodes and at least six of them are expected to air this year. Meanwhile, season four of Covert Affairs is currently airing. The cable channel ordered 16 episodes and 10 of them will have run by September 17th. Covert Affairs will take a month break and then return on October 17th with the first of six remaining episodes. The season finale is expected to air on November 21st. Neither show has been renewed for an additional season yet. What do you think? 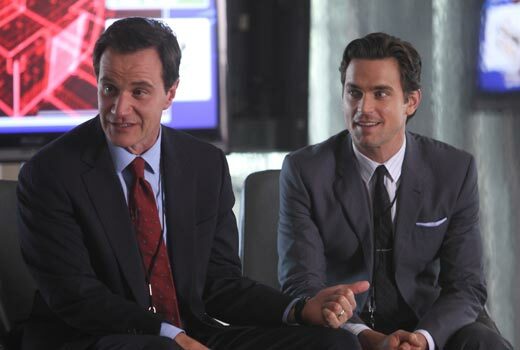 Are you looking forward to the new season of White Collar? Do you think Covert Affairs should take a month break? Covert Affairs has been an engaging story line I would like to see continue. White Collar is entertaining as well. If either is replaced with another fraudulent contest I will leave the network for elsewhere. I fully agree! Both shows are the only reason I watch USA Network! I hate the reality shows, what they portray is far from real life, I agree they are staged, and when they run into overtime it screws up my recordings. I hope they don’t cancel White Collar or Covert Affairs, they are two of my favorites, I don’t like the long breaks between seasons. I remember when a season went from Sept to May, now they basically last for 6 to 13 weeks? C’mon writers can’t you do better than that? I have no problem with taking a month off, its the 6-12mos breaks that I cannot tolerate. I hardly ever watch network television anymore. I primarily watch USA and TBS and FOX news. I never watch reality shows anymore. I love Covert Affairs and White Collar and cant wait for the next series of episodes. Suits is by far my favorite. If USA cancels White Collar or Covert Affairs we’re turning off the cable. I completely agree about the reality shows and they should all be canceled. They help nothing and are mostly staged. Anything else worth watching can be seen for free on CBS, NBC or ABC, even White Collar reruns. Jmho. I agree. I don’t like the breaks either. I always fear the viewers will get in the habit of watching something else and forget to come back. Both of these shows should be renewed. White Collar is the most fun on TV and Covert Affairs is probably next. They are 2 shows I never miss and would be sorely disappointed if they are not renewed. If USA has to dump anything, it should be their new “reality” shows. I much prefer the fantasy. I’m not a fan of these midseason breaks. Sometimes, they’re so long that one almost forgets what’s already happened in the season, and I think it makes it harder for a new show to build a secure fan base. That said, a month isn’t too bad. Regarding “Covert Affairs,” I love the show and hope it gets renewed.